Retrotrials is lucky enough to been sent a special collection of photos of Diego Bosis' actual 1989 Aprilia Climber. Following Diego's natural change towards the end of 1989 to the new 1990 Aprilia , the old model was taken back to the factory in Noale. It was here that it was parked up and ignored for so many years. This bike was yesterdays news and yesterdays bike. Diego secured 3rd place in the World Trials Championship and won the Italian Championship on this machine. Despite Diego being happy with this bike , team manager Ettore Baldini naturally insisted the new riders promote the new 1990 machine by riding it. To the eye , other than cosmetic changes ,the 1990 Aprilia climber wasn't a great deal different to its predecessor. Behind the scenes many parts would be changed , transforming the new stock machine into a replica of the 1989 bike or an improvement on it. 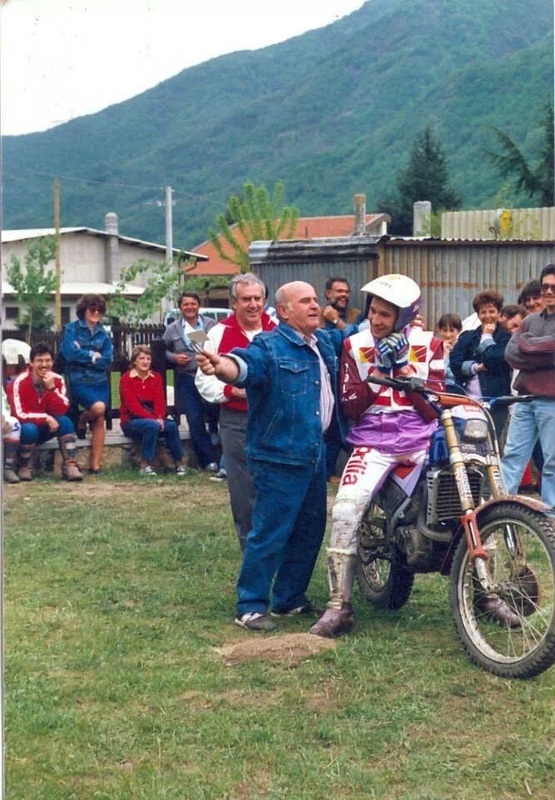 Years later the Aprilia was gathering dust back at the Noale factory ,when Giulio Mauri the famous Italian Trials photographer and huge Trials fan visited as he often would , being a favourite of the Italian teams . He approached Aprilia about buying the trials machines of his idols. After negotiations in 1994 a number of Aprilia's were sold to him . The years that followed saw the Aprilia's of Bosis, Ahvala along with the Fantics of Michaud living in Giulios's display room alongside a Ferrari within his house. Giulio and the great Diego Bosis were good friends. He knew his old bike was in good hands. However a huge shock was to unfold. Unfortunately on the 14th of February 2012 the young Diego passed away ,creating huge waves and real tangible trauma around the Trials World. By an awful double blow , a few months later , in the same year sadly Giulio died whilst riding. After the understandable grief of the loss to the family , attention was eventually drawn to the collection of machines and what to do with them . A decision was made to sell them and discretely and without fuss that's just what happened. This immaculate and incredible collection was split up and sent to the four corners of the earth. One such lucky person had his dream come true. After weeks of negotiation eventually the truck reversed up his driveway containing a wooden crate . Dragged from the lorry containers depths and then down the tailgate lift came the 1989 Bosis Aprilia Climber to his new home. The buyer wishes to remain anonymous. The photographer will remain anonymous also. You never really own something like this. Your simply a custodian of an item , looking after it as best you can. One day it will pass from yours to another and so on . The 1989 Aprilia Climber was part of the sizeable Trials team of Aprilia . Aprilia were a force to be reconned with . If your doubting this....just take a look at this photo that Tommi Ahvala's mother took. The Aprilia factory in Noale has a small museum , that is now closed to the public.This is where this bike lives for many years, polished occasionally , but that's all. A good but old style Michelin X1. A hollowed out clutch arm is not stock.we can only imagine what modifications have been done to the engine. Titanium bolts are almost everywhere. The wheel spindles were machined hollow , where as stock they were solid.